This beautiful nebula, RCW 58, in the southern constellation of Carina, surrounds and originates from a special type of star, a Wolf-Rayet star, WR40 (HD 96548, WN8).The bright blue star in the middle of the nebula in the above image is WR40. 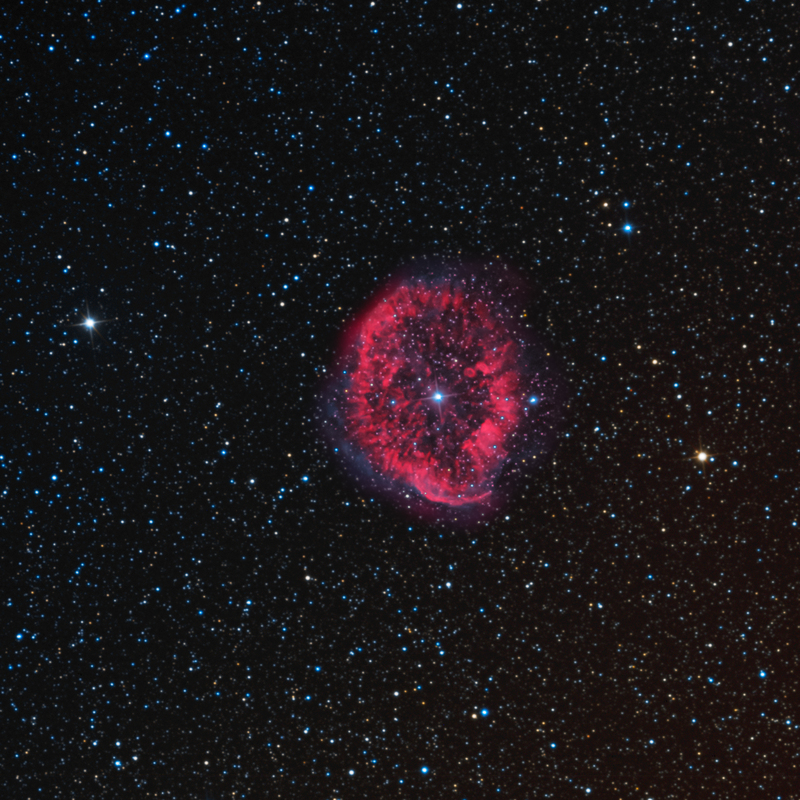 The nebula is referred to as a ring nebula, due to its open appearance. It is elongated north-south 9′ x 5′ based upon the red hydrogen alpha (H-a) data, but the blue-green oxygen (OIII) data extends its width to about 8′ east-west, where north is up. The nebula is expanding at a rate of 87 km/s. It has an unusual appearance with knots and a radial pattern shown by the red H-a data. WR stars are huge, perhaps as large as 20 solar masses. They lose mass as they evolve at an incredible rate, producing very strong solar winds. They are very hot with temperatures ranging from 30,000 to 200,000 Kelvin. There are about 500 of these stars cataloged in our Milky Way Galaxy. They give off a large amount of ultraviolet (UV) radiation that ionizes the surrounding nebula and makes it glow, allowing us to see it. Most of these WR stars are thought to progress to a supernova explosion. The high contrast of narrowband filters were again used to bring out the interesting structure of RCW58 with long 30 minute individual exposures totaling 15.5 hours. A 5 nm H-a filter was color mapped to red/magenta and a 3 nm OIII filter was mapped to blue~green to achieve a "natural color". Star colors were added from shorter exposures using red, green and blue filters based upon a G2V white-point.